The current literature was reviewed for articles focusing on radioguided surgery in urological malignancies. In penile cancer sentinel lymph node dissection is part of international guidelines. By detailed histopathological analysis (serial sections, immunohistochemical staining) more micrometastases are detectable improving the histopathological staging. In prostate cancer this technique also improves staging since a high percentage of patients have lymph node metastases located outside the region of standard lymphadenectomy. Compared to extended lymph node dissection radioguided surgery has a lower morbidity, especially a lower rate of lymphoceles. In bladder cancer the sentinel lymph node (SLN) technique has some limitations. Combined with extended lymph node dissection more positive lymph nodes are removed which possibly improves survival. In renal cell and testicular cancer there are only preliminary results. Further investigations will show whether this technique will play an important role in the diagnostics and therapy of these tumors. In all urological malignancies the SLN concept is only a staging procedure. When the sentinel node(s) is (are) negative, the other lymph nodes are negative, too. Since there are no randomized prospective trials comparing the results of sentinel lymphadenectomy with other techniques of lymph node dissection, it is not clear whether sentinel lymph node dissection also has a prognostic impact. Recent advances in understanding the characteristics of renal cell carcinoma (RCC) have brought to our attention many prognostic markers that affect and predict the survival outcome of patients with the disease. For the moment, however, patients with RCC have not received any benefit from such markers. If a patient is diagnosed as "high risk" by using such prognostic markers, there is no promising systemic therapy available. In this review we mainly focus on biomarkers of RCC that can be applied for therapeutic use reported in recent publications. Several issues and limitations in the reported studies are also highlighted and discussed. Developing biomarkers from the viewpoint of therapeutic application will lead to improvement of the prognosis of RCC patients. Prostate cancer is one of the most commonly diagnosed cancers. Here, we will be discussing two upcoming techniques for its management. One is cryotherapy which has returned from oblivion after nearly 150 years armed with latest technology and looking as if its full potential has been recognized now. On the other hand is high intensity focused ultrasound (HIFU), the application of ultrasound to this field is relatively new and hence a lot of excitement and hope. We searched MEDLINE (PubMed 1942-2005), reference lists of retrieved articles, urology textbooks and our own data looking for studies comparing cryotherapy and HIFU. From 81 titles or abstracts, two independent reviewers identified 50 as potentially relevant. Disagreement was resolved by discussion involving the third reviewer and we finally identified 45 articles. Full reports of 45 articles were retrieved and final selection was made by the same two independent reviewers using the same criteria as for the initial selection. Data were extracted and methodological qualities of selected studies were reviewed by two independent reviewers. Qualitative analysis and synthesis were done. Treatment options depend upon the age of patient, grade of tumor and expectations out of treatment. Patient choice governs the treatment actually to be given. It is the selection of a patient for a particular treatment option that decides how favorable the outcome is going to be. Both these techniques are relatively new and they look promising but both lack long-term data to prove their efficacy. Purpose: Chronic prostatitis (CP) is a common condition. It causes significant suffering to the patients and constitutes a sizeable workload for the urologists. The purpose of this review is to describe the currently accepted concepts regarding the aspects of CP. Materials and Methods: Relevant papers on the epidemiology, etiology, diagnosis, evaluation and management of CP were identified through a search of MEDLINE using text terms "prostatitis", "chronic prostatitis" and "chronic pelvic pain syndrome". The list of articles thus obtained was supplemented by manual search of bibliographies of the identified articles and also by exploring the MEDLINE option "Related Articles". Results: The salient points of the relevant articles on each aspect of CP have been summarized in the form of a non-systematic narrative review. Conclusion: Chronic prostatitis is caused by a variety of infective and non-infective factors and is characterized by a rather long remitting and relapsing clinical course. The diagnosis is based on symptoms comprising pain and nonspecific urinary and/or ejaculatory disturbances and microbiological tests to localize bacteria and/or leucocytes in segmented urinary tract specimens. The contemporary classification was proposed by the National Institutes of Health/National Institute of Diabetes Digestive Kidney Diseases (NIH/NIDDK). National Institutes of Health - Chronic Prostatitis Symptom Index (NIH-CPSI) is the patient evaluation tool used extensively in clinical practice and research. Management should be individualized, multimodal and of an appropriate duration. Aim: This paper compares the cost of open versus percutaneous approaches to the management of large staghorn calculi in a tertiary care hospital in India. 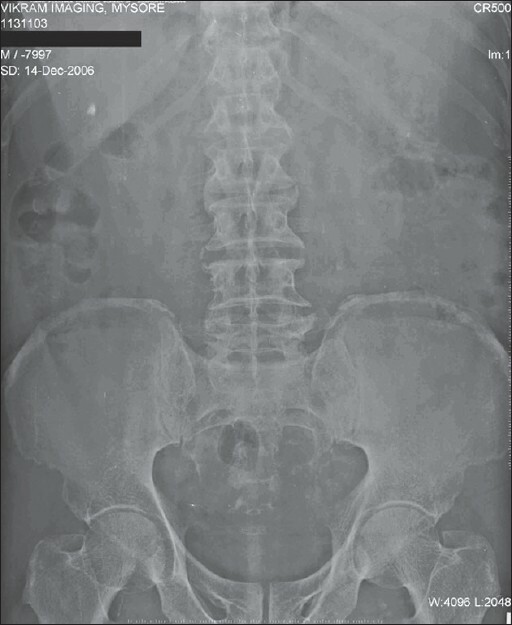 Materials and Methods: Patients who underwent surgery for staghorn calculi larger than 6 cm between January 1998 and December 2003 were included. Those who had confounding factors in terms of cost such as additional surgical or medical procedures and complications unrelated to the surgery were excluded. The process of costing was done by following the clinical pathway. Results: There were 13 patients who had open stone surgery and 19 patients who underwent percutaneous nephrolithotripsy (PCNL). The major differences in cost were seen in the higher cost of instruments and consumables in the PCNL group. The cost of management of complications widened this gap. Two patients in the PCNL group and none in the residual group required redo surgery. The residual stones in the open and PCNL groups required a mean of 2525 and 3623 shocks per patient respectively. Complete clearance after redo surgery and Shockwave lithotripsy (SWL) was seen in 92% and 58% in the open and PCNL arms respectively. The overall cost per patient was $625 per PCNL and $499 per open surgery. The final mean residual stone size in the PCNL group was 4.84 mm whereas it was 0.38 mm in the open group. The effective cost of achieving complete clearance in one patient was $1078 in the PCNL group and $543 in the open group. Conclusion: Open stone surgery is less costly than PCNL in large staghorn calculi. 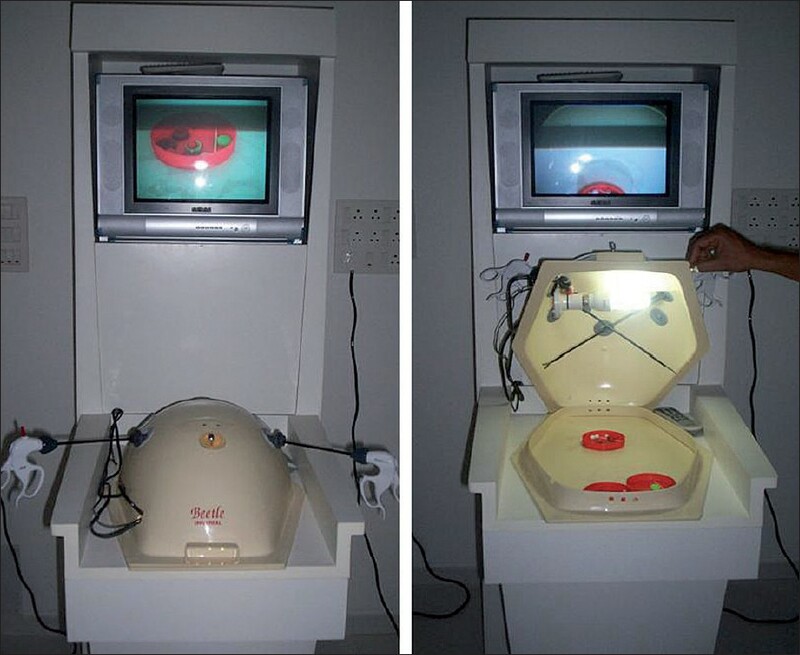 Context: Laparoscopic surgical simulation is a valuable training tool for urology trainees. Aims: We assessed the validity of task completion time (TCT) as an objective tool for practicing and acquiring technical skills in a simulated laparoscopy environment. Materials and Methods: Fifteen participants comprising postgraduate urology trainees from first to third year (n = 12), urology fellow (n = 1) and consultants (n = 2) underwent basic laparoscopic training on the "Beetle Universal" endotrainer. Training included 10 attempts each comprising four tasks; placing a ball in a cup (Task 1), threading five rings (Task 2), threading five balls (Task 3) and tying a suture (Task 4). Individual task (IT) time was measured. The TCT was defined as sum of IT time for a single attempt. Statistical Analysis Used: Statistical analysis was done by Pearson's correlation coefficient and student's t test using SPSS software 10. Results: The average TCT for the first attempt to complete the four tasks by the participants was 76.5 ± 13.0 min (range 38 to 92.5, skew -1.8), compared to the 10 th attempt 33 ± 4.23 min (range 25 to 38.5, skew -0.5). There was statistically significant correlation (r = mean -0.91, range -0.97 to -.83, skew -0.5), ( P = <0.001) between the number of attempts and decreasing TCT for all participants. Correlation decreased when TCT between the sixth to 10 th attempt was compared (r = mean -0.67, range -0.99 to 0.76). Conclusions: The TCT is practical, easy and a valid objective tool for assessing acquired technical skills of urology trainees in a laparoscopic simulated environment. Aims: To compare laparoscopic radical nephrectomy (LRN) with open radical nephrectomy (ORN) in T1-T3 renal lesions. Materials and Methods: The records of 65 patients who underwent LRN between January 2002 and December 2006 were entered prospectively in a database. The patients were compared with 56 patients who had undergone ORN between January 2000 and December 2005. The two groups were comparable in terms of age, body mass index (BMI) and tumor size. LRN was compared with ORN in terms of operative room time, blood loss, complications , analgesic requirement, hospital stay and start of oral intake. The oncologic efficacy was evaluated in stages T1 and T2 in terms of cancer-free and overall survival. Results: The laparoscopy group had a significantly shorter hospital stay (5.72, range 3-23 days vs. 9.18, range 4-23 days, p value: <0.0001), analgesia requirement (175.65, range 50-550 mg vs. 236, range 0-1100 mg of tramadol, p value: <0.03), hemoglobin decline (1.55, range 0.1 to 4.4 mg/dl vs. 2.25, range 0.2 - 7 mg/dL, p value: <0.001) and hematocrit drop (4.83, range 0.3 - 12.9 vs. 7.06 range 2 -18, p value: <0.0001). The majority of specimens showed renal cell carcinoma. In the laparoscopy group, 29 tumors were T1 stage, 18 were T2, while eight were T3. In the open surgery group, 25 tumors were T1, 19 were T2 and 12 were T3. The cancer-free survival rate at 24 months for ORN and LRN in T1 lesions was 91.7% and 93.15% respectively and the patient survival rate was 100% in both groups. The cancer-free survival rate at 24 months for ORN and LRN in T2 lesions was 88.9% and 94.1%, respectively and the patient survival was 100% and 94%, respectively. After LRN, there was one instance of port site metastasis, local recurrence and distant metastasis. All recurrences were distant after ORN. Conclusion: Laparoscopic radical nephrectomy has advantages in terms of shorter hospitalization and a lower analgesia requirement. It is feasible and produces effective cancer control in T1 lesions, comparable to that of its open counterpart in T2 and selected cases of T3 lesions. Aims and Objectives: The incidence of bladder malignancy is increasing worldwide and the projected rise is 28% by 2010 for both sexes (WHO). Though intravesical adjuvant therapy with BCG is superior to any other immunotherapeutic/chemotherapeutic agent in reducing tumor recurrences and disease progression, its real efficacy remains controversial as one-third of the patients will soon become BCG failure. Hence there is a need for an alternative intravesical agent for treatment of BCG failure. Our aim was to study the efficacy, tolerability and safety of intravesical Gemcitabine in managing BCG-refractory superficial bladder malignancy. Materials and Methods: Thirty-five BCG failure patients, 26 males and nine females between 20-72 years of age were instilled with 2000 mg of Gemcitabine in 50 ml of normal saline intravesically two weeks post tumor resection, for six consecutive weeks. Mean follow-up was for 18 months with cystoscopies. Results: Twenty-one patients (60%) showed no recurrences, 11 patients (31.4%) had superficial recurrences while three patients (8.6%) progressed to muscle invasiveness. Average time to first recurrence was 12 months and to disease progression was 16 months. Adverse event was low and mild. Therapy was well tolerated. Conclusion: Gemcitabine fulfils all requirements as an alternative agent, in treating BCG failure patients with low adverse events, is well tolerated and highly effective in reducing tumor recurrences. Background: Invasive bladder cancer is a lethal disease with a 50% cancer-related mortality even in the best healthcare systems. Optimum combination of surgery, external beam radiotherapy and platinum-based chemotherapy has yet to be determined. Purpose: To audit the outcome of multi-modality treatment and compare this with the existing literature in order to set future priorities and re-audit in patients with invasive carcinoma of urinary bladder. Materials and Methods: Between January 2001 and December 2004, 97 patients with invasive carcinoma of urinary bladder were analyzed. Radical surgery was done in 18(18%) patients and adjuvant radiation was given to 20(21%) patients. Radical radiation alone, (≥50 Gy) was given to 26(27%) and chemoradiation to 33(34%) patients respectively. Patients in the chemoradiation arm were given the same dose of radiation with weekly concomitant cisplatin at 40 mg/m 2 one hour before radiation during the first phase only. 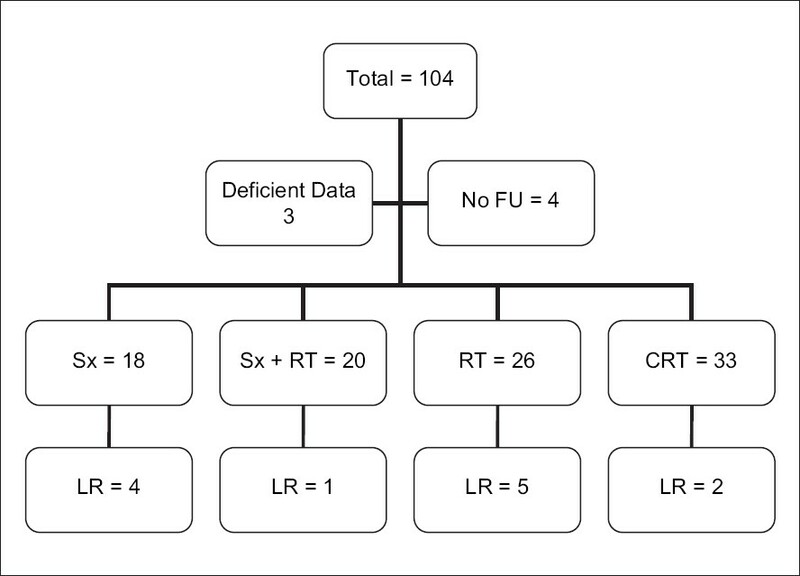 At a median follow-up of 32 months the outcome studied included locoregional failure, distant failure, disease-free survival (DFS) and overall survival (OS) using univariate and multivariate analyses. The OS and DFS were calculated according to Kaplan-Meier. Log rank test was used for statistical significance. Results: Median age of the patients was 58 years. Males comprised 93% of the total patients. Most (93%) of the patients had transitional cell histology. In patients treated with radiation alone overall response rate was 60%, with a complete response (CR) rate of 42%. The CR in patients treated with chemoradiation was 51%. Bladder was preserved in 61% of patients who received chemoradiation as compared to 42% in patients treated with radical radiation. With radical radiation local recurrence rate was 19% as compared to 22% with surgery and 6% with chemoradiation, respectively. Local recurrence rate was only 5% in patients treated with adjuvant radiation. Distant metastasis rate was least with chemoradiation (9%) as compared to 11.5% in radical radiation: curable dose of radiation and 33% with surgery alone, respectively. Patients with adjuvant radiation had a distant metastases rate of 15%. Median OS was 36 months. Factors affecting OS were histology ( P = 0.023) and nodal involvement ( P = 0.034). Median DFS was 26 months. Significant factors affecting DFS on univariate analysis were histology ( P = 0.046) and nodal involvement ( P = 0.004). On multivariate analysis the only factor affecting DFS and OS was nodal involvement (P = 0.01; Hazard Ratio, 0.085-0.719). Conclusion: In patients with invasive bladder cancer, combined modality in the form of radical cystectomy followed by radiation give best local control. Radiation alone is not effective to control muscle-invasive local disease; however, Chemoradiation is an effective alternative to radical cystectomy to preserve bladder function. We present the outcomes of a large series of patients treated with radical cystectomy and pelvic lymphadenectomy for transitional cell carcinoma of bladder. Materials and Methods: A total of 502 patients underwent radical cystectomy (RC) for bladder cancer from 1992 till December 2006. Of these, 432 patients with primary transitional cell carcinoma of bladder underwent RC with bilateral pelvic lymphadenectomy with a curative intent. The clinical course, pathologic characteristics and long-term clinical outcomes were evaluated in this group of patients. Results: The median follow-up was 62 months. There were 30 (6.9%) perioperative deaths and 111(25.7%) early complications. The recurrence-free survival (RFS) and overall survival (OAS) were 66% and 62% at five years and 62% and 40% respectively at 10 years. The RFS and OAS were significantly related to the pathological stage and lymph node status with increasing pathological stage and lymph node positivity associated with higher rate of recurrence and worse OAS (P < 0.001) . A total of 145 patients (33.5%) developed bladder cancer recurrence. Of these, 40 (27.6%) developed local pelvic recurrence and 105 patients (72.4%) developed distant recurrence. The median time to local and distant recurrence was 12 and 16 months respectively. Conclusion: The clinical results reported from this large group of patients demonstrate that radical cystectomy provides good survival results for invasive bladder cancer patients with low incidence of pelvic recurrence. Urothelial carcinoma is potentially life-threatening and expensive to treat since for many patients, the diagnosis entails a lifetime of surveillance to detect recurrent disease. 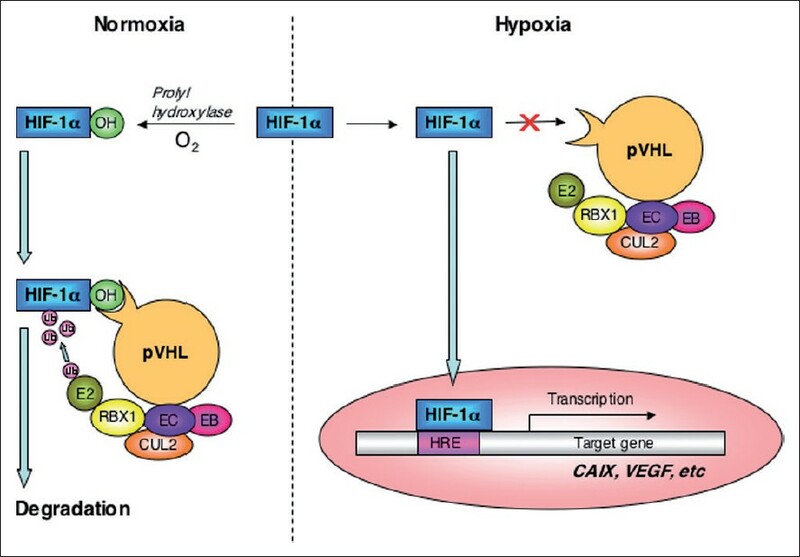 Advancements in technology have provided an understanding of the molecular mechanisms of carcinogenesis and defined distinct pathways in tumorigenesis and progression. At the molecular level, urothelial carcinoma is being seen as a disease with distinct pathways of carcinogenesis and progression and thus markers of these processes should be used as both diagnostics and predictors of progression and patient outcome. Herein we present a selective overview of the molecular underpinning of urothelial carcinogenesis and progression and discuss the potential for proteins involved in these processes to serve as biomarkers. The discovery of biomarkers has enabled the elucidation of targets for novel therapeutic agents to disrupt the deregulation underlying the development and progression of urothelial carcinogenesis. Objective: This article is a systematic review of various changes in the evolution of the contemporary clinico-pathological staging of transitional cell carcinoma (TCC). Materials and Methods: A thorough search of the literature was done by Medline and other internet references. Results: Accurate staging of TCC is necessary for designing optimal therapy in clinical practice. Further, the current emphasis on bladder conservation and improved long-term disease free survival (DFS) necessitates minimal errors in staging and it's predictability towards recurrence and progression. Traditionally, the staging of TCC revolves around clinical and pathological findings. The staging has evolved through the understanding of various clinico- pathological factors like tumor appearance, number, size, grade, depth of invasion, muscle substratification, lymphovascular invasion and has reached the standard TNM classification. Cystoscopy and transurethral resection still remain the mainstay of staging and noninvasive imaging techniques have further enhanced the accuracy. Conclusion: The TNM classification for bladder cancer is currently the gold standard for TCC. Intravesical Bacillus Calmette-Guιrin (BCG) is the mainstay of superficial bladder cancer treatment. We performed a literature search through Medline/Pubmed using key words 'Bacillus Calmette-Guιrin', 'intravesical', 'bladder neoplasm' and 'immunotherapy' for published data in the English language from 1970 to 2007 to review the current status of intravesical therapy and practice recommendations. 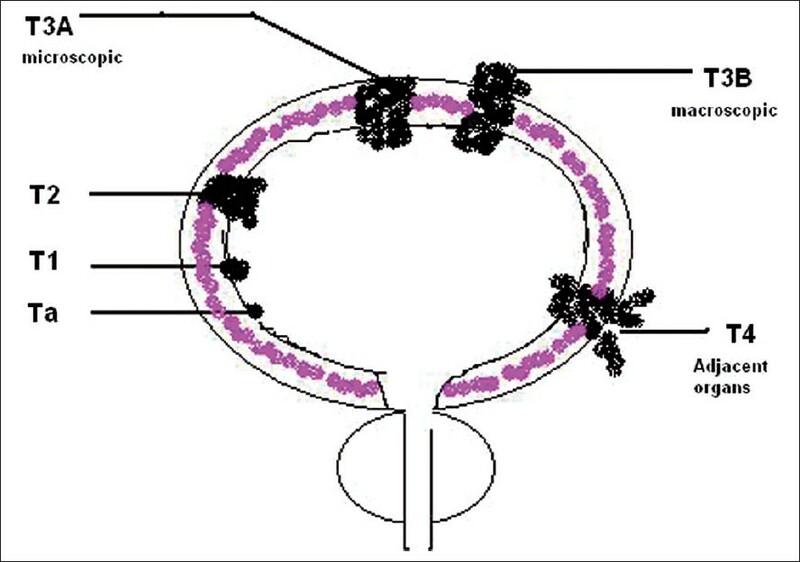 The exact mechanism of action of intravesical BCG is yet to be elucidated. However, it appears that it is mediated by the local immune response, mainly through T-helper cell response. It reduces the recurrence rate by an average of 40% and progression by more than 20% in papillary tumors over the patients without BCG therapy. However, progression prevention is seen only in series which have used maintenance therapy at least for one year. It is effective in CIS of bladder with a response rate of more than 40% and prevention of progression in one-fourth patients. Most acceptable dose, induction treatment and maintenance therapy protocols are discussed. However, these are yet to be confirmed in large randomized trials. Intravesical BCG is well tolerated in most of the patients with mild to moderate side-effects in induction therapy; however, most patients do not complete maintenance therapy due to side-effects which is the most common concern at the present time. The management of T1G3 (or high-grade T1) bladder cancer poses a challenging clinical dilemma to the urologist. There are good data supporting bladder conservative therapy with repeat transurethral resection and administration of Bacille Calmette-Guιrin (BCG) intravesical therapy but this must include maintenance regimens since only maintenance BCG has been shown to decrease tumor recurrence and progression. Concern over worse survival with a delay in definitive therapy has prompted many to recommend immediate cystectomy for T1G3 disease. Ultimately, the decision needs to be individualized and although certain pathologic factors (T1b disease, early recurrence or progression within three months of BCG therapy, lymphovascular invasion and variant histology) are prognostic of progressive disease, no definitive risk factors for tumor progression have been identified. Background: There is a significant variation in the treatment strategies adopted for the treatment of locally advanced T3b, T4a, N1-3 and metastatic bladder cancer. There is increasing evidence that we would be able to offer them some benefit in terms of disease-free survival and improving the quality of life. This article is aimed at reviewing the current literature on the treatment strategies in locally advanced and metastatic bladder cancer. Materials and Methods: Extensive literature search was done on Medline/Pubmed from 1980-2007 using the key words - treatment of locally advanced, metastatic bladder cancer. 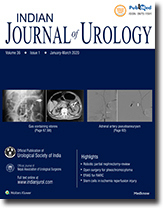 Standard textbooks on urology, urologic oncology and monograms were reviewed. Guidelines such as National Comprehensive Cancer Network guidelines, European Urology Association guidelines and American Urology Association guidelines were also studied. Results and Conclusions: There is a place for radical cystectomy in locally advanced T3b-T4 and N1-3 bladder cancer. Radical cystectomy alone rarely cures this subgroup of patients. There is increasing evidence that meticulous surgical clearance and extended lymphadenectomy has significant impact on disease-free survival. Adjuvant chemotherapy has been found to be effective in terms of recurrence-free survival and better than cystectomy alone. Neoadjuvant chemotherapy followed by radical cystectomy also has beneficial effects in terms of downstaging the disease and improving recurrence-free survival. This perioperative chemotherapy (adjuvant/neoadjuvant) has 5-7% survival benefit and 10% reduction in the death due to cancer disease. Excellent five-year survival rates have been achieved in patients achieving pT0 stage at surgery following chemotherapy (around 80%) and overall 40% five-year survival in node positive patients, which is promising. Though practiced widely, perioperative chemotherapy is not considered as a standard of care as yet. Current ongoing trials are likely to help us in reaching a consensus over this. There is no role of preoperative or postoperative radiotherapy in locally advanced/metastatic bladder cancer except in non TCC bilharzial/squamous cell carcinoma of bladder. Use of nomograms and prognostic factor evaluation may help us in the future in predicting the disease relapse and may help us in tailoring the treatment accordingly. Newer and more effective chemotherapeutic drugs and ongoing trials will have a significant impact on the treatment strategies and outcome of these patients in the future. Objectives: Whereas local control is often insufficient in conservative management of T4 bladder cancer, neoadjuvant chemotherapy delays definite treatment, which could result in increased therapy-associated morbidity and mortality during the course of the disease. Primary cystectomy has been reported to be associated with a high complication rate and unsatisfactory clinical efficacy. Herein, we report postoperative outcome in 21 T4 bladder cancer patients subjected to primary cystectomy. Materials and Methods: Twenty-one patients underwent radical cystectomy for T4 (T4a/b: 14 and seven cases, respectively) bladder cancer. 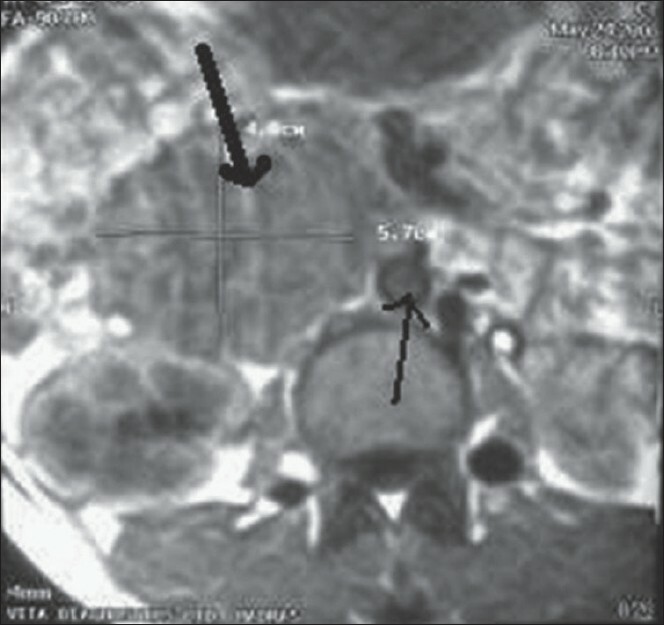 At the time of surgery, eight patients had regional lymph node metastases (N2: 6; N3: 2). The average age was 64 (52-77) years (≥70 years: n = 7). 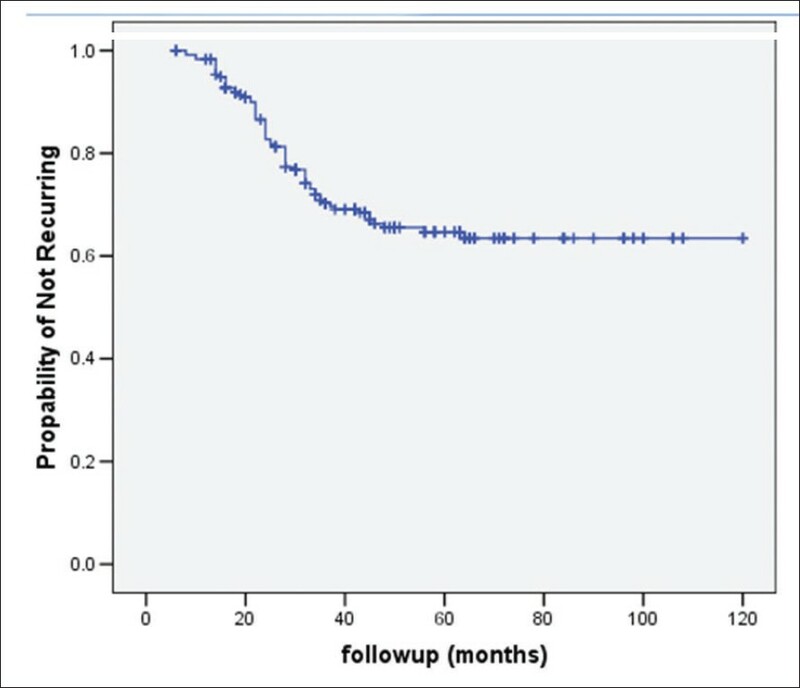 The postoperative follow-up was 13 (1-36) months for the whole group. 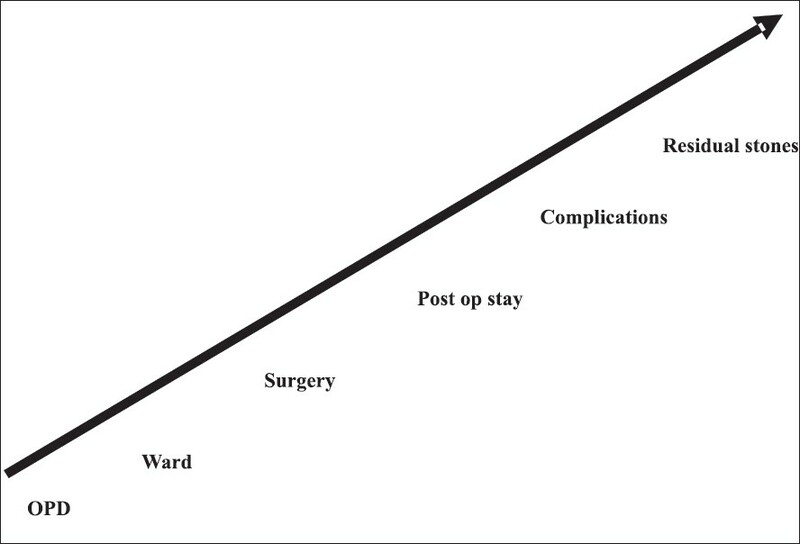 Results: Mean duration of postoperative hospitalization was 19 (11-50) days. Whereas 10 patients received no intra - or postoperative blood transfusions, an average number of 3 (1-7) blood units were administered in the remaining cases. The mean postoperative hemoglobin value of patients not receiving any blood transfusions was 10 (8.5 - 11.4) g/dl. Major therapy-associated complications were paresthesia affecting the lower extremities (n = 3) as well as insignificant pulmonary embolism, enterocutaneous fistulation and acute renal failure in one patient, respectively. At the time of data evaluation, 11 patients were still alive after a follow-up of 20 (6-36) months. Four patients ≥70 years at the time of cystectomy were still alive 11, 11, 22 and 31 months following surgery, respectively. Conclusion: Primary cystectomy for T4 bladder cancer is a technically feasible approach that is associated with a tolerable therapy-related morbidity/mortality. Additionally, a satisfactory clinical outcome is observed even in a substantial number of elderly patients. Radical cystectomy remains the standard treatment for muscle-invasive carcinoma bladder. Various methods have been described for the urinary diversion. In the last 150 years urinary diversion has evolved from cutaneous ureterostomy to the orthotopic neobladder. Especially during the last 20 years, much advancement has been made. We hereby have reviewed the current approaches being used at different centers in India. We have also analyzed the evolution of diversion from conduit to the orthotopic substitution at our center. Tumors arising from the inferior vena cava are rare. The commonest histological type among these rare tumors is leiomyosarcoma. 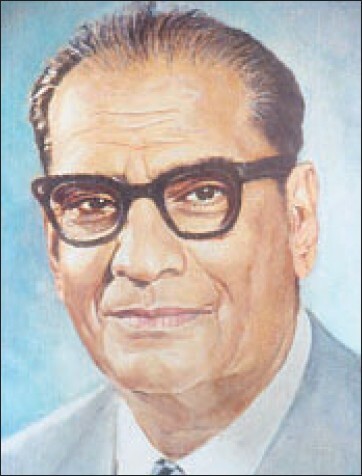 Complete resection of the tumor is the mainstay of management. Concomitant right nephrectomy during resection may be required. As the collateral circulation of the left renal veins is extensive and well-developed, reconstruction of left renal vein is not required generally. 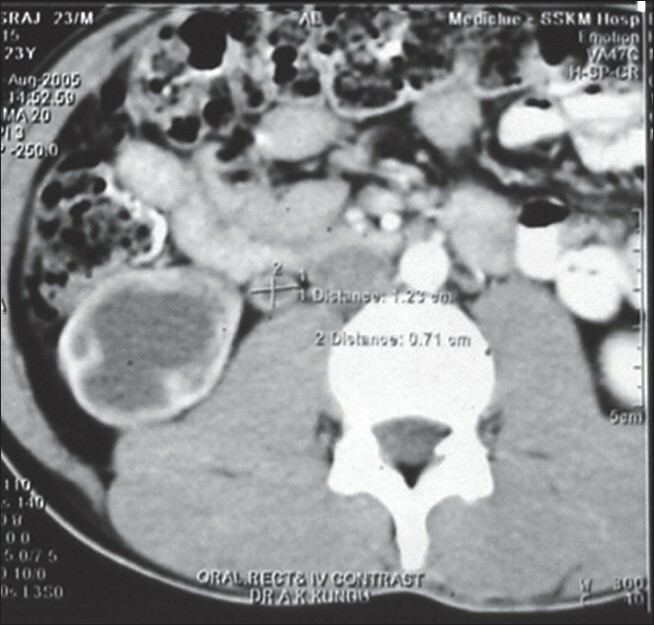 This case report provides a situation, which may warrant the reconstruction of the left renal vein as the patient developed postoperative renal failure. Authors recommend the reconstruction of the left renal vein in a similar situation disregarding the collateral circulation. We report a successful implantation of Indian penile prosthesis after total phallic reconstruction. The differential stiffness of the Shah penile prosthesis is felt to have less potential for erosion, the most common complication of rigid prosthetic stiffening devices when used in a neo-phallus. This prosthesis is an alternative to the inflatable prosthesis in patients who choose a rigid prosthesis due to economical constraints. Symptomatic prostatic cyst presenting as obstructive lower urinary tract symptoms (LUTS) is an infrequent diagnosis in males. Midline cysts are much more likely to obstruct the bladder outlet. We report our experience with four such cases in the last one year, along with a short review of the literature. Two of these cases had additional presenting symptoms besides LUTS - febrile Urinary tract infection (UTI) with perinephric abscess and primary infertility. 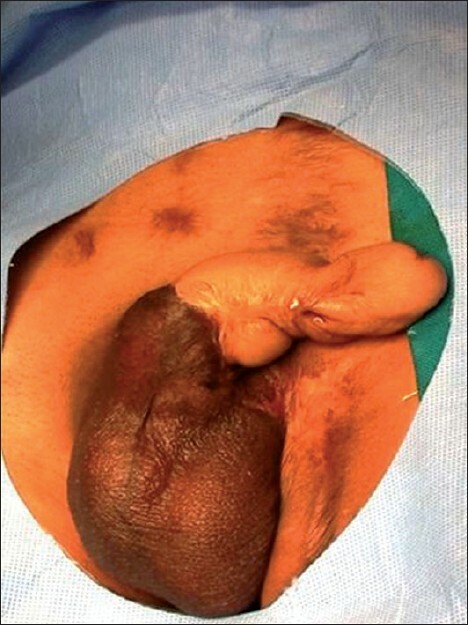 One case had an anterior midline prostatic cyst which is an extremely rare entity. The remaining three had midline posterior cysts. All cases were treated with transurethral marsupialization, had good relief of symptoms and no adverse effects. Oral cavity cancers form the third most common cancers among men in south India. The oral cavity is a very rare site for metastases and has been described in various cancers, particularly lung, breast, kidney and colon carcinoma. Here a very rare case of a buccal metastasis from prostate carcinoma that was originally evaluated as a primary oral cavity malignancy is presented. Histopathological examination of a biopsy of the lesion revealed papillary adenocarcinoma Grade II, nuclear Grade II, which initiated the evaluation of prostate. 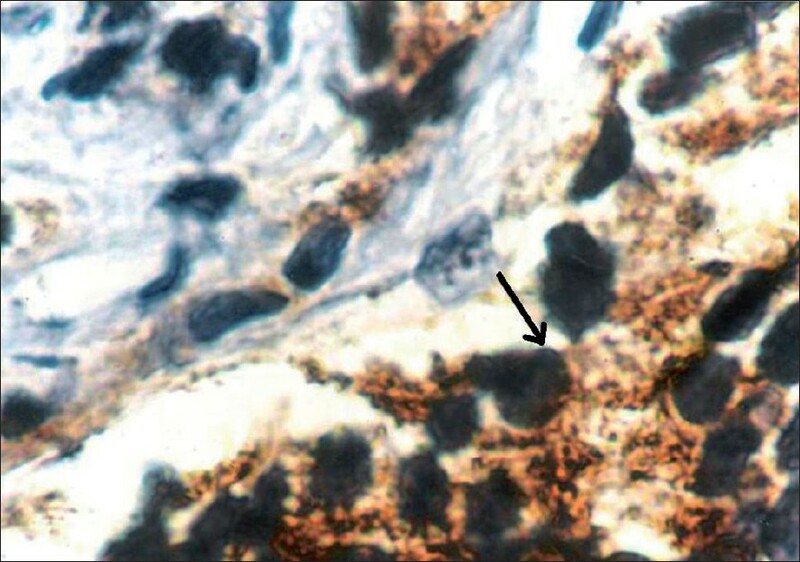 On evaluation diagnosis of carcinoma prostate was made which was confirmed by immunohistochemistry for PSA. Anaphylactic shock was noted following an apparently uneventful transurethral resection of the prostate (TURP). Lidocaine jelly was used prior to urethral dilatation and before placement of three-way Foley. Lidocaine sensitivity was diagnosed serendipitously when lidocaine jelly was used for application of ECG electrodes. Anaphylaxis may be one of the rare differentials to be considered in a patient with postoperative shock following TURP. This report highlights a potentially fatal complication of an apparently innocuous and ubiquitous urological use of lidocaine. We report a rare case of echinococcosis, primarily involving the right kidney and ureter, presenting with gross hydatiduria. We also present the salient diagnostic features of renal hydatid. 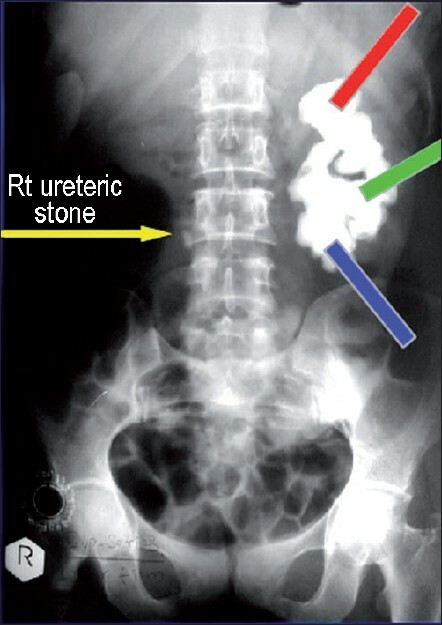 Percutaneous nephrolithotripsy is the treatment of choice for large renal calculi. Total stone clearance as the treatment goal remains elusive, despite staged procedures and multiple tracks. There is also the morbidity of multiple sittings and tracks. We investigated the feasibility of a synchronized approach to clearing these difficult stones with two teams operating through two or more tracks in tandem and also the ergonomic and logistic issues involved. Stone management in horseshoe kidneys is challenging: percutaneous nephrolithotripsy is a safe and effective procedure in the treatment of large stones within horseshoe kidneys. Simultaneous bilateral PCNL has been described with a single surgeon operating sequentially on one renal unit following the other under the same anesthetic. We describe synchronized bilateral PCNL by two operating teams in tandem for a patient with bilateral stag horn calculi associated with a horseshoe kidney. We report two cases of chromophobe renal cell carcinoma with unusual histological features; one case of eosinophilic variant of chromophobe renal cell carcinoma and another case with extensive metaplastic ossification.